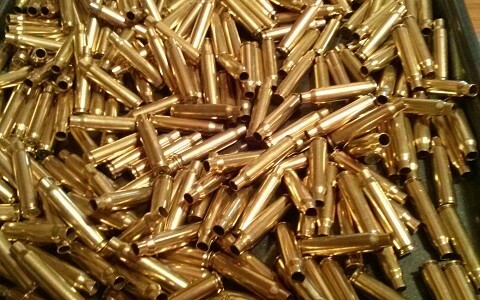 There’s nothing like reloading with nice shiny brass. 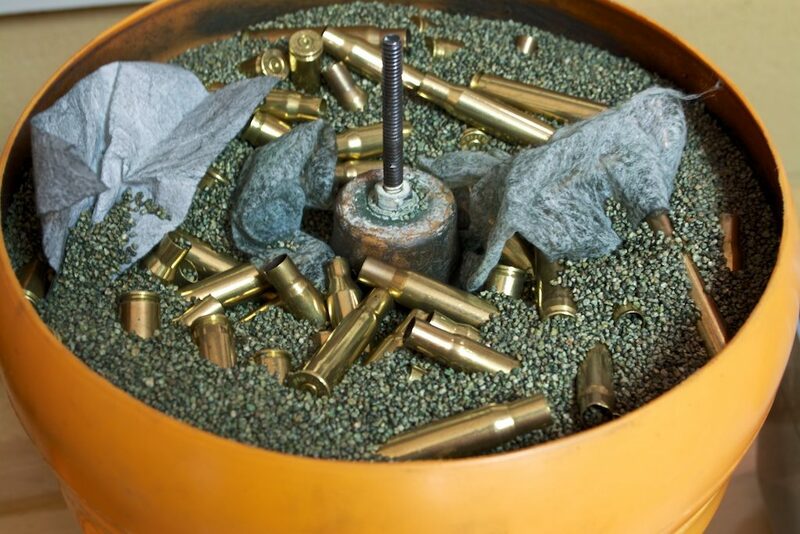 Like most, I had started my reloading adventure with a vibrating tumbler and corn media. It came in a nice, inexpensive kit with a bucket and separator device as well. Toss the brass in, squeeze in a bit of polish, turn it on and walk away for a few hours. Then it’s a matter of separating the corn cob and scraping out the media that got stuck inside of the brass (I used an old ice pick for that). The brass was clean and polished, no doubt. It just wasn’t ZOMG-SHINY™. I spent a great deal of time on reloading message boards looking for various tips about reloading in general. They’re right. You totally should. Any resistance is futile. If you reload, you’re probably going to go with steel at some point or another. It’s inevitable. It’s effective: The big one is that it gets brass shiny. We’re talking a jewelry like shine. Remember when C-3PO was all polished up and shiny at the end of Star Wars: A New Hope? Steel gets the brass THAT shiny. It’s thorough: It also polishes the brass inside and out along with the primer pocket and flash hole. Yes, it’s a cosmetic thing that most people would never see but there’s an arguable advantage as well. Now, my research has shown an almost 50/50 split in opinion but there is a good chance that a shiny and clean interior will make for a more efficient powder burn. I relate it to your car’s engine. Carbon buildup in the cylinder causes the gas to explode with less force/efficiency than it normally would. This results in a significant drop in your engine’s horsepower. It stands to reason that the bullet cartridge would behave the same way. Combine that with an unobstructed flash hole and your primer can get its charge to the powder more efficiently as well. It’s fast: I work in small batches and where it would sometime take upwards of 4 hours to shine up brass with the corn, I can achieve greater levels of shine with only 1.5 to 2 hours of tumbling with steel. It’s cleaner: I never once did a polishing with the corn media where I didn’t have to go through and scrape gummed up corn meal out of a bunch of casings after a polishing session. I tried every trick they said in forums. Nothing worked. I would get about ¼ of the brass gummed up. I haven’t had that problem with steel. I might wind up with 1 or 2 casings that have 2 of the little steel rods jammed into the flash hole but that’s a very rare occurrence. Out of all the polishings I’ve done so far, I’ve had to pull those out of maybe 5 or 6 casings so far. There are a few extra steps when polishing with steel. Now, if you factor in the time you’re saving with the polishing time itself, you’re still going to come out ahead of corn or walnut. Just be aware that it’s not as simple as toss in the stuff and call it a day. There’s a price aspect as well. On the surface, steel is going to cost you more than most other methods. That’s only if you go with the “Mercedes” setup that everyone seems to recommend. Going with that will set you back around $300. The problem is, I’m on more of a “beat up, barely working 1970 VW Beetle” kind of budget. First off, steel media is steel media. It’s around $40 for a 5 pound bag for starters. As long as it’s the right size, it really isn’t going to matter what kind you get. The other thing to keep in mind is, unlike corn or walnut, you’re not going to have to replace the steel after a few polishes. The stainless stuff will last almost forever. You might have to bolster it at some later point because, despite your best efforts, the occasional piece will jump out and disappear. After a couple thousand polishings, you might notice a slight drop in volume. The tumbler, however, is where you can make your huge savings. 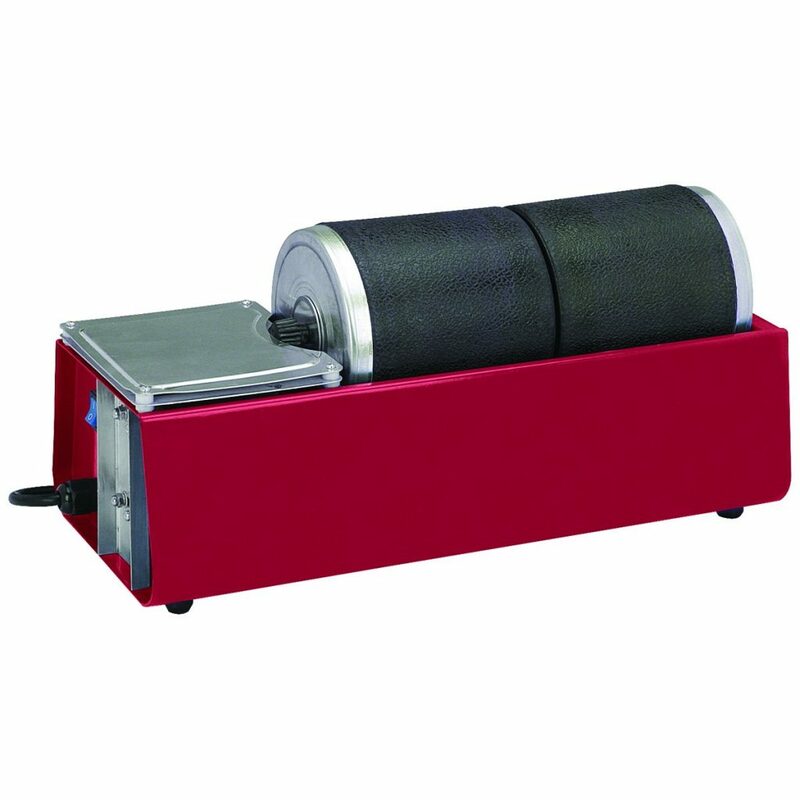 The popular option seems to be a Heavy Duty Rotary Tumbler ($200) which can work on 15 pounds of stuff at once. It’s beefy and expensive and boy do I want one. To save money, I went with Harbor Freight’s Dual Drum Rotary Tumbler ($60). This is normally a $90 item BUT it is constantly on sale for $60. 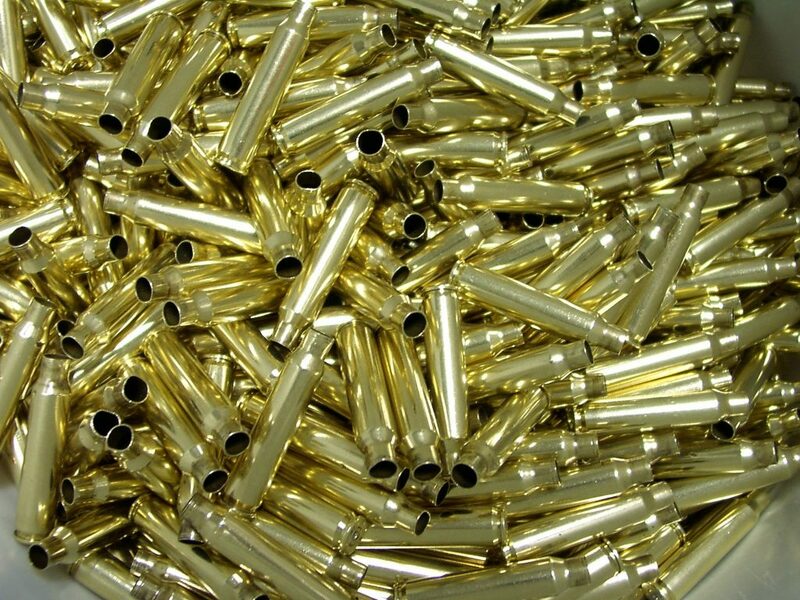 These can only do about 2-3 pounds of brass at a time (1.5 per barrel) but I’ve found that 1 pound of 9mm brass comes out to around 100 casings. So on average I’m polishing about 200 casings at a time with my setup. As tempting as it may be, do not use a vibrating tumbler for steel polishing. They aren’t made to handle the weights of steel and it will destroy it. So I got my tumbler and media. I went to my work bench, tossed in some brass and steel, poured some water in, sealed it up and set it to work. Two hours later, when I opened it up, the brass was….not as shiny as the corn media brass. So I put it back on for another 2 hours. Same thing. So I went on Google. Ok, it turns out I missed a couple things. In this case: Dish Soap. So I tried again: Brass, steel, water and a healthy squirt of dish soap. Four hours later, same result. It was then that I learned about LemiShine. It’s the secret to shiny brass. It’s essentially concentrated citric acid that’s used to clean dishwashers and such (side note: it does wonders for cleaning your dishwasher). You can find canisters of it in most chain grocery stores. This time I added a healthy dose of Lemi along with the previous recipe. Four hours later, the brass looked like blackened, antique brass. It was shiny but looked, old. It turns out, too much LemiShine can actually darken the brass. It’s not permanent, mind you, but it’s certainly disheartening. So after quite a few experiments, I have come up with the following recipe specifically for the Harbor Freight tumbler. Keep in mind, the weights and measurements are per drum. Harbor Freights also makes a single drum tumbler and this recipe will work just fine for that as well. 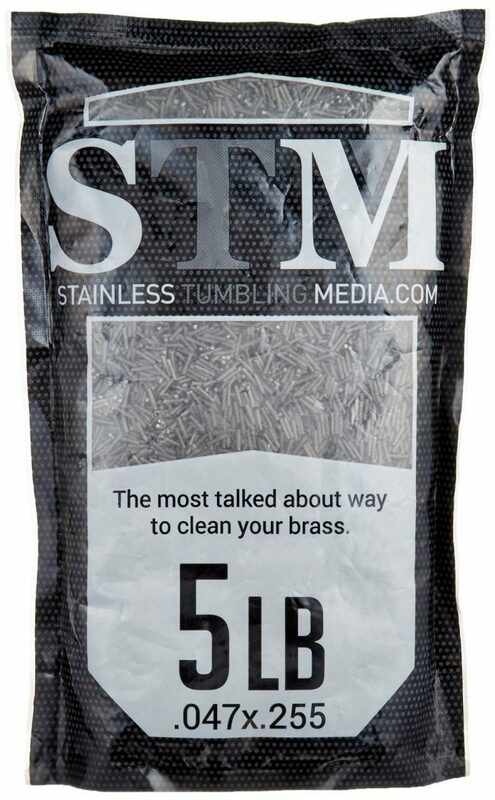 Tumble for two hours then separate the brass from the media and dry. This recipe will result in your brass looking almost brand new. It’s even rescued the most scummy brass I had found at the outdoor range. This was stuff that I put in the “to be sold for scrap” pile. One thing I’ve come to learn in my experimentation is the time spent tumbling the brass is important. There’s a sweet spot, it seems, where the brass will be perfectly polished. The longer it sits, however, the longer that LemiShine has to work and it will start darkening the brass no matter how much you put in. I discovered this the other day when I got distracted by a bug in some software I was writing and left it tumbling for about 5 hours. The brass looked just as bad as when I was using a tablespoon of LemiShine all the way back at the beginning of my adventure. So here’s my tip on that: start with 2 hours. 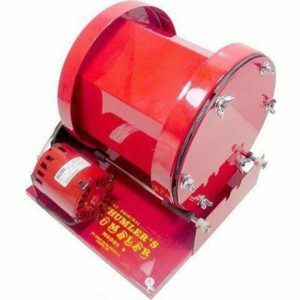 At the two hour mark, stop the tumbler and pull a casing or two out and see how they look . If you like it then the tumbling stage is over. If you still feel like there’s some more shining to do, put it in for another half hour and evaluate again. Try not to exceed 4 hours, though, lest thou darken thy brass. With this being a wet tumbling method, how you dry the brass is also somewhat important. 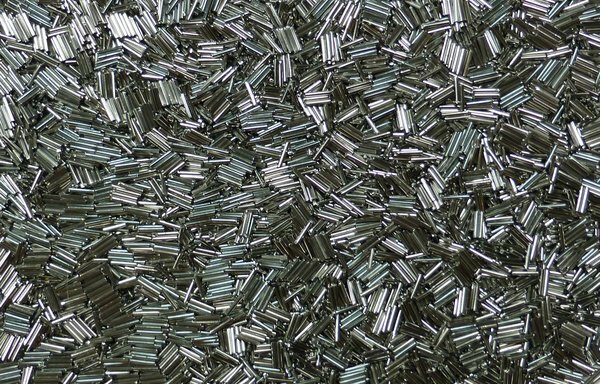 Once you’re done tumbling, you’ll want to separate the brass from the steel pins using whatever method you choose. After that, it’s very important to rinse off the brass. You don’t want that soap and LemiShine residue to stay on the brass. I typically just hose it off in my backyard. You can also use the sprayer from your kitchen sink BUT I’m hesitant to do that myself because I’m not entirely sure what would happen if a few errant steel pins got into my garbage disposal. Those things are a pain to fix/replace. So now that your brass is tumbled, separated and rinsed, time to dry it. Most people just dump the brass on to a towel then fold the towel over and let it sit. This takes a couple hours to dry the brass but it has the advantage of not costing anything. I’d like to believe all of you have towels in your home so you should already have everything you need for this method. In my case, a long time ago I bought a jerky maker proceeded to make sub-par beef jerky that didn’t really last very long. 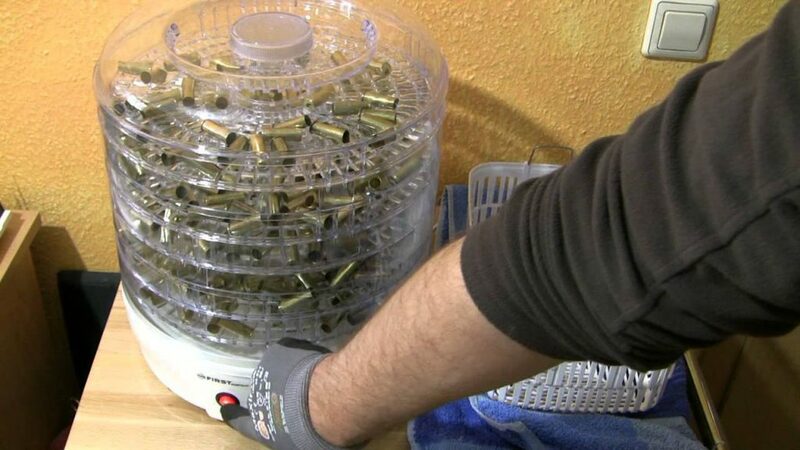 Although if you don’t have one on hand…just get a regular dehydrator ($40). At least you can make some other stuff. The dehydrator was then banished to a shelf in my garage and forgotten. That is until I started tumbling my brass this way. Now it sits on my workbench and I just spread the brass out onto the various racks and let the machine make jerky out of them for 15-20 minutes. Then, after a short cool, they’re ready to reload. So the legends are true…you should totally switch to steel tumbling media. Just be sure to follow our tips and you’ll be golden…like your brass! Excellent article! Thanks for doing all the leg work for us. Great write up. LemiShine is great, but you can also buy bulk citric acid (same stuff) online for much cheaper (I think I got like a 5lb bag a few years ago for under $20, still have 90% of it left). I love my Frankford Arsenal Rotary Tumbler, would highly recommend for higher volume cleaning. I can realistically fit 500+ 5.56 cases at a time, and the tumbler comes with 5lbs of steel media (haven’t needed to buy more in a year and a half). Very HELPFUL article. I really like my STM tumbler. I have been plagued with the blackened crappy turn out occasionally. I always suspected a piece of ‘steel’ getting into the batch and some sort or reaction. I have almost always tumbled 3 hours, sometimes more. I am tumbling two batches right now and will cut off at 90 minutes and check results. 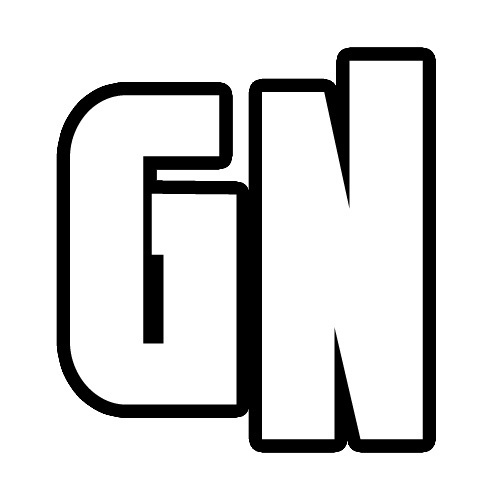 Thanks again for the article!